Astronauts Douglas Wheelock and Tracy Caldwell Dyson wrapped up a successful spacewalk Monday, installing a new ammonia pump to help flight controllers recover from a failure that shut down half the International Space Station's cooling systems. "We had an extremely successful EVA today," Kirk Shireman, deputy manager of the space station program at the Johnson Space Center, said after the spacewalk. "We're very pleased with the reswults. We still have some more activities this afternoon and tomorrow to fully recover from the pump module failure, but things are certainly looking positive and we're looking forward to that." Wheelock and Caldwell Dyson had hoped to finish the excursion by installing a long extension cord between the Quest airlock and the Unity module that is needed before attachment of a cargo module during a shuttle visit in November. But work to pack up tools and equipment used for the pump replacement work ran a bit long and the cable installation was deferred. "We're going to call this a victory and go ahead and drop the J612 (cable) task and ingress the airlock," Oscar Koehler called from mission control. The seven-hour 20-minute spacewalk began at 6:20 a.m. EDT and ended at 1:40 p.m., pushing the total time for three coolant system repair EVAs to 22 hours and 49 minutes. Wheelock's total through six career spacewalks now stands at 43 hours and 30 minutes, moving him up to 10th on the list of most experienced spacewalkers. Total EVA time for station assembly and maintenance stands at 944 hours and 24 minutes -- 39.4 days -- through 150 spacewalks. Before repressurizing the Quest airlock, Wheelock asked for an update on the newly installed pump. "The pump is looking good," Koehler reported. "Oh, sweet," Wheelock replied. "I hope the day continues like this as we start everything back up and we've got our station back." "Concur with that," Koehler said. It will take flight controllers, working with the astronauts aboard the station, until Wednesday or Thursday to restore normal operations in the wake of the July 31 failure of the ammonia pump in coolant loop A. With half the station's cooling system out of action, the astronauts had to install jumpers to transfer loads from loop A to loop B and to route additional power to the Russian segment of the station. All of that allowed the station to continue near normal operations with three of four stabilizing gyroscopes, life support systems and critical communications gear. But with one loop out of action, experiments in the Japanese Kibo module and the European Space Agency's Columbus module had to be powered down, along with most of the science racks in the U.S. segment of the station. And with only one coolant loop in operation, the space station had no redundancy in a critical system. As a result, NASA managers decided to defer a spacewalk planned for Aug. 5, opting instead to stage two complex spacewalks to remove the failed ammonia pump and install a replacement. 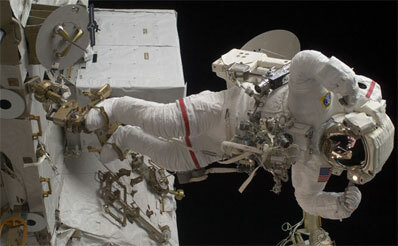 Four spare pump modules were available, stored on the station's main power truss as a hedge against failures. During the first repair spacewalk Aug. 7, however, the astronauts ran into problems disconnecting one of four ammonia lines leading to the failed pump. Falling behind schedule, Wheelock finally released a quick-disconnect fitting only to report a significant ammonia leak. Flight controllers told him to tighten the quick-disconnect and to leave the line in place while they considered a variety of options. They ultimately lowered pressure in the line by venting nitrogen and during a second spacewalk Aug. 11, Wheelock was able to remove the M3 connector. He and Caldwell Dyson then removed the failed pump and mounted it on an attachment fixture at the base of the station's robot arm. During today's spacewalk, the astronauts had no major problems installing the replacement pump, the oldest of the four available spares. Flight controllers successfully activated the pump module and reported normal operation. "And Wheels, just to confirm, we did not see any ammonia come out today, amazingly," Koehler radioed. "So if you can confirm you saw no ammonia during any of the QD ops we are go with no ammonia tests at the end of the EVA." "OK. I did not, Oscar," Wheelock replied. "I did at one time, though, saw what I thought were just a couple of little snowflakes. But I'm not able to confirm that. There was no leak or anything." A few moments later, Wheelock showed off a cue card on his spacesuit's left wrist that thanked flight controllers and ended with the words "Game over!" "The pump was installed successfully, it checked out great, we saw good pressure of the nitrogen inside the pump during its initial checkouts," said Flight Director Courtenay McMillan. "We had good data checkouts to the pump and we were able to do what's called a bump start test, which actually spins the pump a little bit. We got it up to a thousand RPM, so it is looking good." After the spacewalk ended, flight controllers repressurized loop A, raising the pressure from 160 pounds per square inch to 160 psi and finally, 330 psi, the normal operating level. After monitoring the system's performance overnight, controllers plan to briefly shut down the loop Tuesday, allowing systems that had been temporarily shifted to loop B to be reset for loop A. "The team in mission control right now is working on re-pressurizing loop alpha, so we hope to be able to get that loop up and running in the next couple of hours," McMillan said. "If all goes well tonight, then over the next couple of days we're going to be returning the whole station to nominal configuration. "That means we will have to power the loop back down, and all the components on it, so that we can unjumper some of the loads that were powered through a contingency jumper inside the station and then get them back up in their normal power configuration. So that's going to take about 24 hours to get done after we've had some time to look at how the loop is working overnight tonight." The final steps in the recovery, removing the last of the contingency jumpers, is expected Thursday. "The best thing about this is this will allow us to recover and to focus on research, which is the primary purpose of the International Space Station," Shireman said of the repair work. "We plan to accomplish up to 63 hours of research next week. So really looking forward here to getting back to normal and doing the kinds of work the space station was meant to accomplish." But first, the astronauts will enjoy a bit of time off. McMillan said the crew is "really excited to getting the pump up and running." "The whole team likewise is in a great mood and everybody is looking forward to some well deserved rest after the effort of the last couple of weeks."